Then, choose the Event Triggered Campaign option. Once you do that, you'll go through a four-step process to get that campaign set up. Before you start: There are some important things to consider about event attributes in event triggered campaigns. They can be used in action content, to refine recipients, and override email headers. Read more here. From the dropdown, choose the event that you want to use to as a campaign trigger. The preview will show any recent occurrences. If you've never sent the event to your account before, type the event name manually (the event name is case-sensitive). If you have a particular event attribute you want to use as a filter (e.g., if you only want to target users who bought a specific product), click and add your attribute filter either by clicking on "Add as filter" next to the desired attribute in the event preview, or by adding it manually. If users need to be in a particular segment in order to receive your event triggered emails, add that segment as a filter. When a triggering event is sent to us but it doesn't trigger the event-triggered campaign, it will retry for approximately 30 minutes, giving the user a chance to match the filter criteria and enter the campaign within that time. This buffer allows for a very common situation where, due to internet latency or other such delays, we get the event before we get other qualifying data. 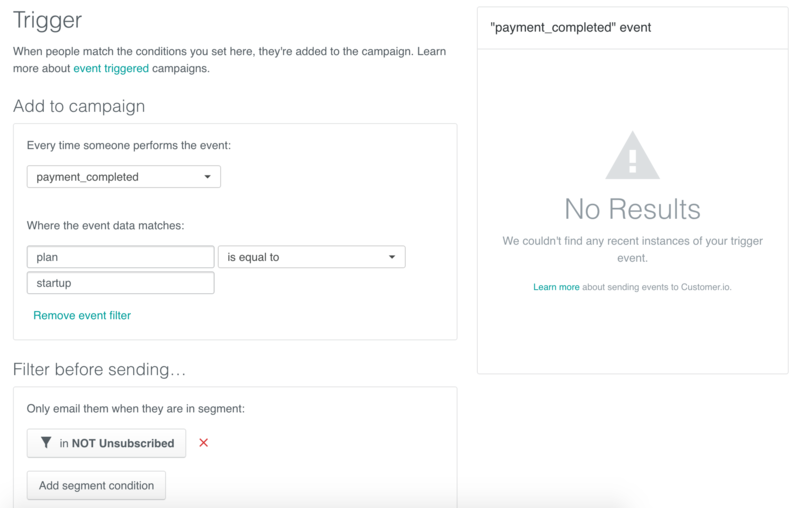 In order for users to match your event campaign, they need to match both the event attribute filter and the segment filter(s) within a maximum of 30 minutes after the event took place. Add Content - Go into the composer, where you can create and personalize your message. These settings are on a per-email basis, so if you want to make sure no future emails added to an event triggered campaign get sent to unsubscribed users, it might be easier to add a filter segment with the rule "unsubscribed is not equal to true". 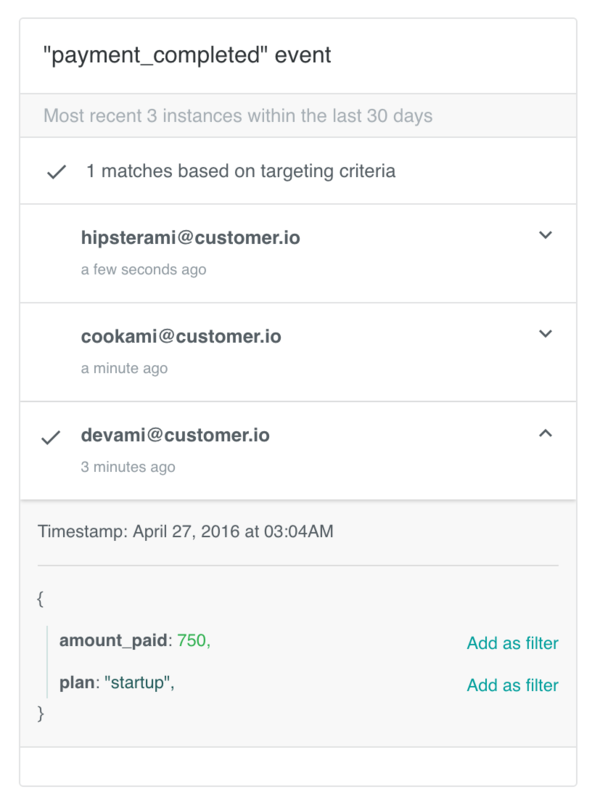 A Customer.io webhook action allows you to connect to just about any public API. You can then combine it with the data in Customer.io and use it to update a CRM, send a postcard, trigger an NPS survey—the sky is the limit! 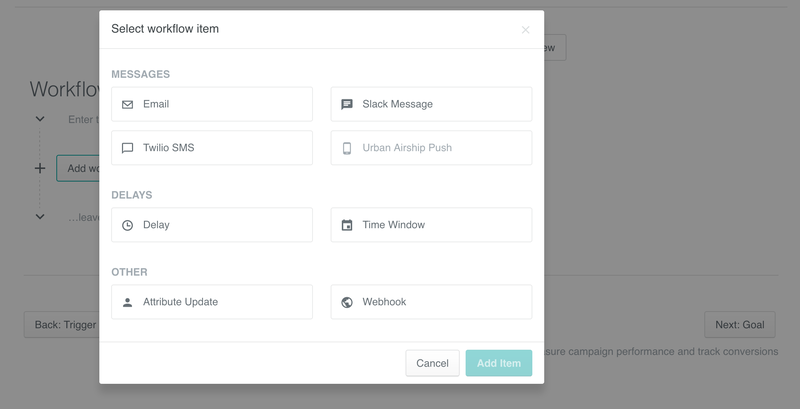 We have detailed documentation on webhook actions if you'd like to add one of these. If you want people to wait a certain amount of minutes/hours/days before they receive a message, add a delay in front of it. If there's no delay or time window before a message, it's sent immediately. If you'd like to customize when people get messages during the week or day (for example, only on weekdays), add a time window before that message. It will only be sent when that window is open. You can select specific days, specific times, and time zones. Once you’re done, click "Save window” and your preferences will be saved. You can combine delays and time windows in the desired order (first a delay or first a time window). This order doesn't affect how users receive messages, so choose what makes most sense to you. After you add your first element to the workflow, you have the option to choose exactly where to add any further actions by clicking the desired "ADD [ELEMENT] HERE" area. Curious about what happens when the trigger or email order are modified? We have answers. 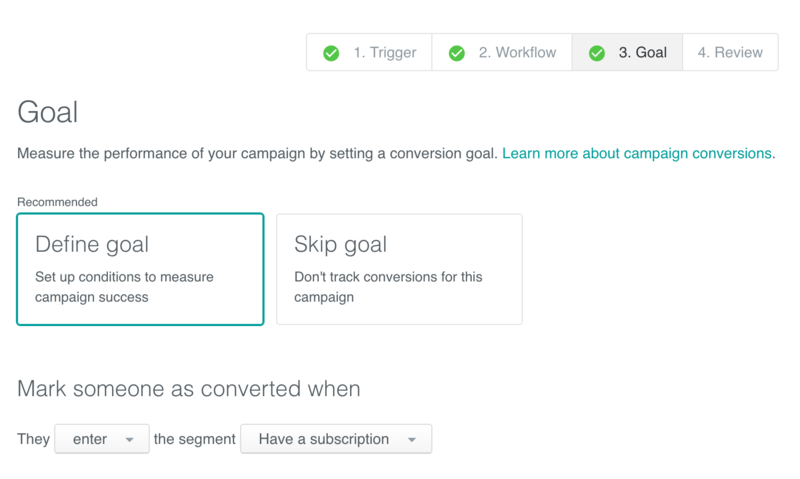 Conversion tracking allows you to track the success of your email, so you'll want to choose a segment that is relevant for your email (a user using a feature, a user signing up for a paid plan, a user no longer being inactive, etc.). 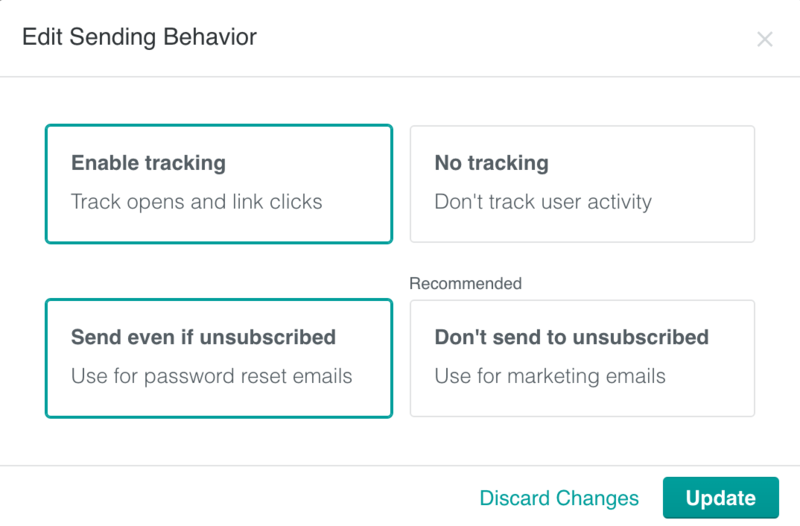 If a user enters/exits that segment after being sent the email, they'll be tracked as a conversion. Review is the final step of the campaign creation process. It offers you a last overview of campaign setup, to make sure you haven't forgotten anything! If everything looks right, you can choose your campaign matches and click Start Campaigns! Your campaign has been started. 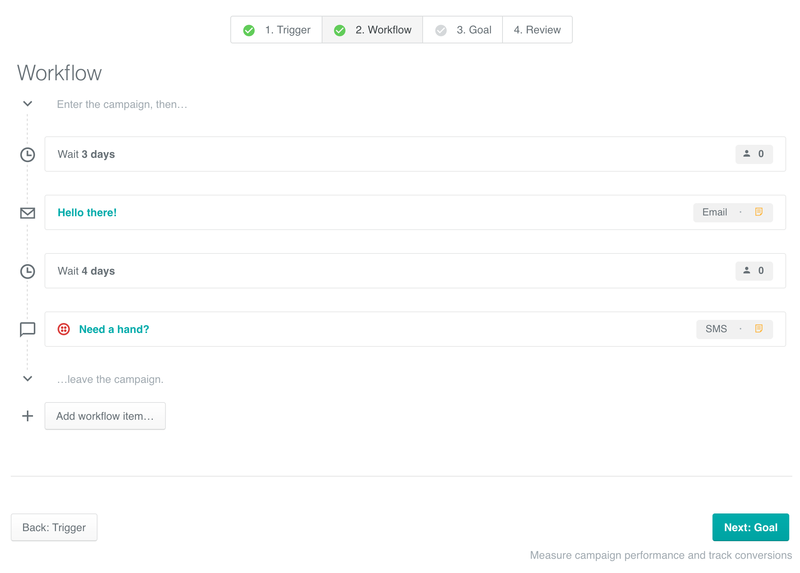 You can now click Show Campaign Overview.